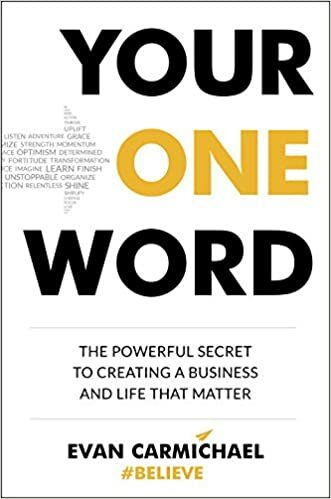 I Ran Across Another “One Word” Book! | "Jane Likes to Read"
I Ran Across Another “One Word” Book!! Now some of you know that part of my word I believe God gave me for 2017 was to Fast from excess/accumulation and that includes Books! To read what I have and practice what I have already learned! To take Action in 2017!! ANYWAY, I talked it over with Kevin and bought the book as I had tried to take notes from the podcast and felt it was so pertinent to what I am believing to do in 2017! YES!!! The book was soooooo gooooood! It is about getting focused on what your Core Belief is to help you focus your business, ministry, or life. It asks questions to try to help you come to what that is. Such as: What makes you happy? What is the connection between all those things? What traits do you hate? What is your constant? Is this who you really are? Then he goes over limiting beliefs. Evan uses amazing examples and stories from other people and gives practical application to actually “DO IT”, not just read about it! I am so excited to see that my ONE WORD for 2017 and this new understanding of My One Word, my core, converges. I believe that Evan gives an amazing tool to create the business/ministry that I have been dreaming of and working toward. I believe that you would really enjoy the book as well! By the way, here is the podcast link too for you to be inspired by!